Obituary for Gail Heather (Williston) Baverstock | Adams Funeral Home Ltd.
Black River Bridge, N.B. - Gail Heather Baverstock, wife of Stanley Baverstock, of Route 117, Black River Bridge, N.B., passed away suddenly at her residence, on Saturday, May 7, 2011, at the age of 70. Born in Hardwicke, New Brunswick, on June 27, 1940, she was the daughter of the late Hubert and Jean (MacDonald) (Keoughan) Williston. She was a homemaker and was Anglican by faith. 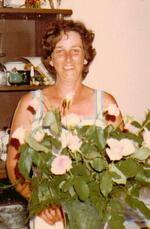 She is survived by her husband, Stanley; 2 daughters, Candice Thompson and Barbara Baverstock, both of Mississauga, Ont. ; two sons, Gary and Daryl Baverstock, both of Mississauga, Ont. ; two sisters, Joy Fawcett (Bart), of Moncton and Barbara Flanagan (Ted), of Erin, Ont. ; two brothers, Blair Williston (Susan), of Oakville, Ont., Bliss Williston (Kathy), of Mississauga, Ont. ; seven grandchildren; four great grandchildren; as well as several nieces and nephews. She was predeceased by one daughter, Geneva Heather Baverstock, who passed away on the same day, May 7, 2011; her father, Hubert Williston and her step father, Richard Keoughan. By her request, there will be no visitation or service in New Brunswick. A funeral service will be held in Mississauga, Ont., at a later date, with interment in the family lot of Springcreek Cemetery, Mississauga.